Could Martha Coakley be Suffolk’s next president? Suffolk University president Margaret McKenna (left) and former Massachusetts Attorney General Martha Coakley. Suffolk University president Margaret McKenna, whose short tenure has been marked by tumultuous relations with the school’s governing board, has been told privately that the board has the votes to fire her if it chooses and has been asked to resign, according to a person close to the university. At the same time, the board is in negotiations with former state attorney general Martha Coakley to take over as president, according to the same person, and confirmed by a second person briefed on the developments. McKenna, reached late Thursday evening, denied she is being forced out. The board of trustees has taken no formal vote to oust McKenna, and the school has not finalized any deal with Coakley, according to both people, who spoke on the condition of anonymity because of the ongoing negotiations. But such an abrupt change, just seven months after McKenna’s appointment, would mark yet another bump in the road for the school, which has suffered from a revolving door of presidents since longtime leader David Sargent retired abruptly in 2010 amid outrage over his lavish pay, which totaled $2.8 million in the 2006-07 academic year. McKenna is the school’s fourth leader in five years. McKenna said Thursday she was told only by a board member in a private conversation that there would be a story in the Globe saying board chairman Drew Meyer has enough board votes to oust her. McKenna acknowledged tension and rumors about board dissatisfaction but denied being asked to step down. “There’s clearly some tension, but did they ask me today to resign? No,” McKenna said. She said she is happy with her progress and planned to stay but will do what is best for the school. McKenna, a former federal civil rights attorney and longtime president of Lesley University, took over in July with promises to raise the university’s stature by increasing fund-raising and streamlining the academic programs. She also pledged to make the school more accessible to students and leaders in the city. This year Suffolk has opened a new academic building on Somerset Street and sold several buildings on Beacon Hill. 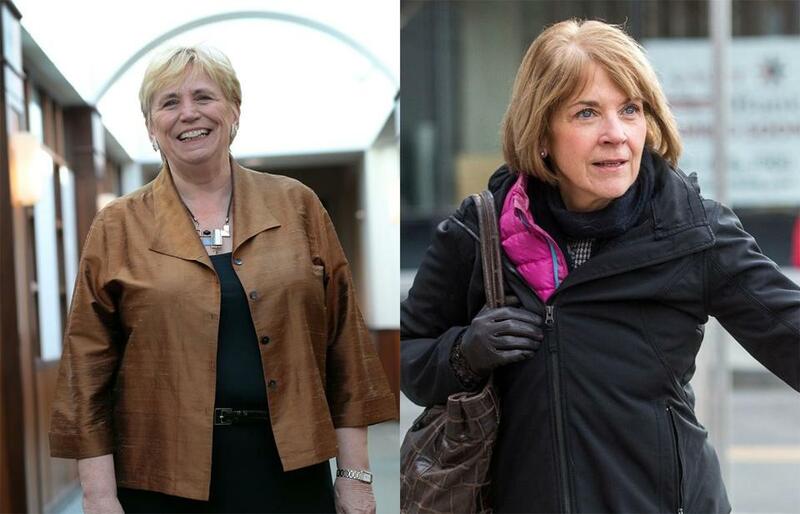 Coakley did not immediately return three calls for comment Thursday. The state’s first female attorney general, Coakley held the position from 2007 to 2015 and emerged as a national leader on the foreclosure epidemic, wrangling some $900 million in settlements from lenders and investment banks that fueled the subprime mortgage crisis. She also cracked down on for-profit colleges, won major settlements with pharmaceutical companies that engaged in Medicaid fraud, and helped push a tough domestic violence bill through the state Legislature. In addition, she famously filed an early challenge to the constitutionality of the Defense of Marriage Act. But Coakley also gained a reputation as a poor campaigner in her failed bid for the Senate in 2010, when she suffered a humiliating defeat to Republican Scott Brown, and in 2014, when she lost a close gubernatorial election to Charlie Baker. Travis Andersen and David Scharfenberg of the Globe staff contributed to this report. Laura Krantz can be reached at laura.krantz@globe.com. Follow her on Twitter @laurakrantz.